Over the years, we here at the Soccer Field Academy have developed a philosophy of growing players, enhancing their potential. This is not only an on-field endeavor, but an off the field one as well. Ensuring our students have the best possible environment for growth is important to us, and that begins at home, with friends and family. To that end, this is the first in a series of blogs designed to help educate family and friends about some simple Do’s and Don’ts when it comes to supporting your young player. One of the hardest but most vital lessons parents must learn in order to better support their young player is one that seems simple. Yelling is bad. Shouting at players from the sidelines is not only discouraged, but is in fact detrimental, no matter how well intentioned. No matter how tempting, parents must resist the urge to shout instructions to the players. It is vitally important that the only instruction players receive comes from the coaching staff. Even if the advice coming from the parent in question is good advice, it’s important that players learn, especially in their developmental years, that coaches are who they need to be listening to. As the players grow older and mature, this “no yelling” directive takes on an added dimension. 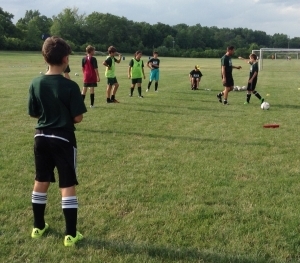 A large part of player development is their “soccer IQ”, their ability to read the game and make their own decisions based upon the situation. As players grow often coaches will take a step back during matches and training, leaving more and more of the decision making to the players. The main reason for this is to sharpen their tactical awareness. For players to continue to develop this must be respected. That’s not to say that complete silence is expected, or even wanted. Cheering on your young player, and more importantly the team, is always encouraged. Cheering for goals, clapping for good passages of play, anything you’d expect to see a crowd doing at a professional game is generally acceptable, as long as it’s encouraging and not distracting to the players. ​Another vital component to creating a positive learning environment is to avoid placing too many pressures on your child. Critiquing their performance immediately following the match or training session in the car on the way home is usually not the best approach. Children naturally want to please their parents, so this type of immediate critique can be demoralizing, negatively impacting future training and matches. Instead let your child first approach you about the game and stick to asking open-ended questions in order to have them reflect on their own performance. This dialogue not only takes pressure off your young player, but can help them think more critically of their own performance in a constructive environment. Stay tuned for more blogs on the do’s and don’ts of supporting your young players, and if you have any questions please reach out via the comments, email, or Facebook!